The Paper Hat Game. Photo by Craig Bares. BOTTOM LINE: Using intricate puppetry and arresting visuals, The Paper Hat Game follows one man’s quest to spread joy. If a stranger handed you a paper hat, how would you respond? Would you laugh, cringe, awkwardly turn away? Would it make you smile? Would you take it? Using multi-layered puppetry, video projections, and evocative soundscapes, The Paper Hat Game invites us to consider the role of whimsy in our lives through the story of Scotty Iseri, a real-life artist known as the “Paper Hat Guy” for his distribution of paper hats to Chicago’s subway passengers. In an attempt to connect with others and break up the monotony of urban existence, Iseri begins folding discarded subway newspapers into paper hats, then passing them out to fellow commuters. This process develops into an unspoken game, the simple “rules” of which we see scroll banner-like across the piece’s tiny playing space: the instigator cannot speak to participants or force them to accept the hats, but “everyone wins” regardless of the outcome. At first met with suspicion or bafflement, Iseri becomes something of a local celebrity as his scheme brings a touch of joy to people’s daily lives. However, this innocent game is cut short when Iseri is mugged in a hit-and-run and subsequently develops agoraphobia. Nudged out of isolation with the help of friends, strangers, and a protective clothing iron, Iseri struggles to regain the courage and openheartedness in which his game took root. Patently expressionistic, The Paper Hat Game stands on its striking aesthetics, each component blending harmoniously in service of both story and atmosphere. 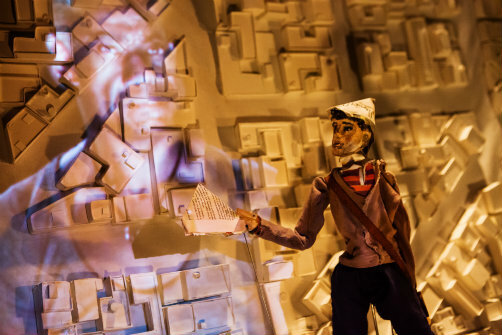 In a playing space roughly the size of a flat-screen television, a cast of five unseen puppeteers builds, manipulates, dismantles, and reconstructs the urban territory of Iseri’s waking life and the equally-fraught world of his subconscious. Human hands construct the titular hats before our eyes, then crown doll-sized puppets with miniature versions. Elaborate wood-and-paper constructions unfold into sprawling horizons or contract into suffocating boxes of mind and body. A puppet Iseri navigates his way through intricate street-mazes, rides oversized irons, and alternately chases and flees snaking vehicles. Video designer Raquel Salvatella de Prada’s shifting stop-motion projections form an organic backdrop to the puppetry, the two elements often layering so seamlessly as to be indistinguishable. While they’re meant to suggest Iseri’s Chicago, her pulsing subway cars, winding streets, twinkling nightscapes, and haunting tunnels evoke the bustle and commotion of any major city. Likewise, Colbert Davis’ and Matt Hubbs’ sound designs perfectly underscore the show’s visuals. The trains’ rattle and screech consistently punctuate a string-based instrumental soundtrack, while droning dial tones and ambient noise become sinister or heartbreaking through the lens of Iseri’s trauma. In the show’s rare moments of dialogue, we hear passengers respond in both real-time and interview format to the hat game, and are given brief access to their secret thoughts. After the curtain call, the actors and production team invite audiences backstage to chat about the piece and view its puppets more closely. While the post-show experience is optional, I highly recommend it; in addition to some great photo ops, this literal peek behind the curtain gives you fascinating insight into the experience and a deeper respect for its virtuosity. The Paper Hat Game ultimately asks whether childlike wonder and human connection can survive in the face of adversity. Can we create beauty despite the chaos around us—or, as the show’s oddly-appealing trappings suggest, find inspiration within it? Its bittersweet ending draws no conclusions, but, like the Paper Hat Guy himself, The Paper Hat Game gently prods us to entertain a little magic—or at least look twice at those bizarre subway performers. The Paper Hat Game is directed and created by Torry Bend, and is co-presented by 3-Legged Dog and The Tank as part of The Tank’s Flint & Tinder Program and 3-Legged Dog’s Artist Residency Program. Video Design by Raquel Salvatella de Prada. Puppet Design by Aaron Haskell. Sound Design by Colbert Davis and Matt Hubbs. Light Design by Jeanette Oi-Suk Yew. Movement Direction by Kate Brehm. Assistant Video Designer is Thomas Kavanagh. Assistant Light Designer is Christian Specht. Electrician is Tomas Del Valle. Production Stage Manager is Luisa Sanchez. The cast is Angela Olson, Steve Ackerman, Yoko Myoi, Drina Dunlap, and Alex Young. Sarah Krainin is the understudy.